As oil reaches a new record of $143 per barrel today, I think it’s safe to say that energy – and possible alternatives to fossil fuels – are topics on everyone’s mind. Before the development of fossil-fuel based energy technology, wind-power wasn’t an alternate form of energy – it was just the way things were done. Julian Lamborn, Master Docent for the Wiess Energy Hall, has been kind enough to share the history of wind technology as well as share his case for developing wind energy today, in this two-part post. The winds of the world today bring with them the promise of low cost, renewable and sustainable electricity which will help feed the world’s insatiable demand for energy. One perk of using wind energy is it has a low atmospheric pollution potential. In 2007, the globally installed capacity of electricity generation from wind increased by some 26.6% over 2006. The global capacity of wind-generated electricity is currently equivalent to some 1.3% of the world’s electricity needs with Germany producing the most wind power. In fact, Germany has 22,247 megawatts of installed wind generating capacity which meets between 5% and 7% of the country’s electricity needs. Here in the USA (which, at 16,818 MW, is second only to Germany in installed, wind-generating capacity) about 1% of our electricity needs are met by wind generation and in Texas particularly, this number rises to 3%. Texas is also the state that uses the most wind energy. It’s all very well talking about a megawatt of wind generated power, but what can it actually do for you in your home? In very round numbers, one megawatt of wind generating capacity typically will satisfy the electricity needs of 350 households in an industrial society, or roughly 1,000 people per year. Although wind generators are placed in windy areas and designed to run optimally at wind speeds between 25 and 35 mph, wind does not blow all the time. 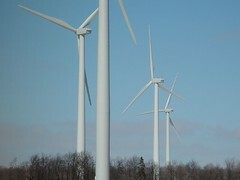 In the USA wind generators work at about 30.5% of their capacity. But, of course, this is the modern story. 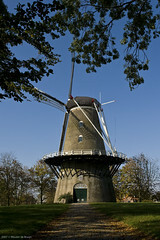 The first windmills were developed to automate the tasks of grain-grinding and water-pumping. The earliest-known design is the vertical axis system developed in Persia about 500-900 C.E. (although there is some suggestion that King Hammurabi of Babylon in c 1760 B.C.E used wind driven scoops to move water for irrigation). The first known documented design of a Persian windmill is one with vertical sails made of bundles of reeds or wood which were attached to the central vertical shaft by horizontal struts. Windmills as we know them today from paintings by the Dutch Masters first appeared in the late Middle Ages, although it took another 500 or so years for the highly efficient mills of the Dutch to be fully developed. However, by the late 19th century, all the technology was in place to allow the design of the first power-generating wind-mill. This first use of a large windmill to generate electricity was a system built in Cleveland, Ohio, in 1888, by Charles F. Brush. Compared to today’s behemoths producing up to 3.6 MW or more, Bush’s machine was a lightweight producing just 12 KW! 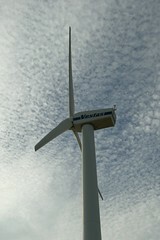 The modern wind powered generating devices, such as those near Abilene, typically each produce 1.5 to 2 MW of power at around the same 4.5 cent cost per kilowatt-hour as electricity from coal but without the co-production of greenhouse gases.